With a brief court appearance, Saddam Hussein this week changed the world's picture of him from December's bedraggled fugitive to July's gaunt but defiant figure. The legal significance of Thursday's proceedings took a backseat to the symbolism of the moment: A former dictator arriving in chains, then identifying himself by saying in Arabic: "I am Saddam Hussein, the president of Iraq." 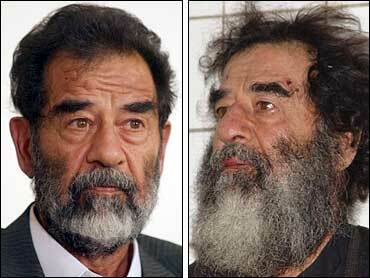 Saddam's trial will not take place until 2005 at least. But the outcome seems in little doubt. And even though Iraq has suspended the death penalty, attorney Frank Rubino tells the CBS News Early Show that Saddam's fate is also no mystery. "It's a foregone conclusion. He faces the death penalty if convicted. It will be rendered and he will be executed," Rubino said. But U.S. and Iraqi officials hope Saddam's trial will do more than convict and possibly condemn one man. It is also aimed at laying bare the atrocities of Saddam's regime and helping the country recover from years of tyranny, the U.S.-led invasion and the insurgency that blossomed in its aftermath. Its impact on opinion — in Iraq and around the world — is key. On Thursday, Iraqis clustered around small TV sets in cafes, hotel lobbies and shops, to watch raptly as Saddam appeared in court. Many people called for his execution, and some said he doesn't deserve a trial. Others felt the time isn't right to seek justice. A few defended the former dictator. "I just hope they will try him by his own law. He knew nothing but executing people for even minor or imaginary offenses," Khaled Mohammed, 28, said as he watched with two friends at a cafe on Baghdad's Saadoun Street. "Such a person shouldn't be tried. Standing a trial is an honor he doesn't deserve," said Rahman Aziz, 27, owner of a CD and cassette shop. "He should be sent directly to the gallows." Aziz said he was tortured in one of Saddam's prisons for seven months, after the secret police found CDs of Shiite Muslim literature in his shop. But Mohammed Kazem, a 32-year-old laborer, disputed the need for any trial. "Saddam only hurt those who tried to harm Iraq — the traitors — not the Iraqi people," he said. In the central city of Ramadi, a Sunni Muslim area where support for Saddam has been strong, Odai Faleh voiced doubts that the former president was guilty of much beyond punishing those who deserved it. "At least Saddam provided us with security. We have seen nothing good from the Americans," he said. Sporting a crisp white shirt and a pinstriped suit jacket, Saddam dominated parts of the 26-minute exchange. As the hearing opened, he called it "theater" and said President Bush was "the real criminal." He challenged the judge to identify himself and state his authority. The judge, who officials have refused to identify, said he represented the Iraqi people and acted under coalition authority. "So you are an Iraqi representing the coalition forces?" Saddam asked. "No," the judge replied. "I am an Iraqi representing the Iraqi judicial system." Speaking in strong, defiant tones, Saddam offered advice. "I hope you remember that you are a judge ... empowered by the people," he said, holding up a raised index finger. "It doesn't really matter whether you convict me or not, that's not what's important ... don't mention anything to do with the occupying forces, this is not good ... judge in the name of the people, this is the Iraqi way." Several times, Saddam tried to interrupt. Repeatedly, the judge cut him off. Saddam learned of seven broad charges against him: the killing of religious figures in 1974; gassing of Kurds in Halabja in 1988; killing the Kurdish Barzani clan in 1983; killing members of political parties in the last 30 years; the 1986-88 "Anfal" campaign of displacing Kurds; the suppression of the 1991 uprisings by Kurds and Shiites; and the 1990 invasion of Kuwait. At one charge — the invasion of Kuwait — Saddam's eyes flashed in anger. He argued he'd invaded the country "for the Iraqi people." As Saddam spoke, he frequently stroked a neatly trimmed salt and pepper beard and dark mustache, or ran his hand over his bushy black eyebrows. Often, he gestured with his hands, pointing at the judge for emphasis. At one point, he took out a pen and began taking notes on a small piece of yellow paper. "I was surprised he was so belligerent in court. I was also surprised they brought him into the courtroom without having a lawyer present," Rubino told the Early Show. "He gained control of the courtroom and the judge lost it. That was a terrible mistake." In the United States, Mr. Bush watched a televised replay of the hearing, said White House spokesman Scott McClellan, who brushed off reporters' questions about Saddam's remarks on Mr. Bush. "I'm sure Saddam Hussein will continue to say all sorts of things," McClellan said. "What's important is that Saddam Hussein and his regime leaders are going to face justice from the Iraqi people before an Iraqi court." Afterward, 11 other defendants appeared one by one to hear the charges against them. Most appeared to be tired, broken men, shadows of their former roles as masters of Iraq. Best-known among the 11 are former Deputy Prime Minister Tariq Aziz, long Saddam's spokesman in the West; Ali Hasan al-Majid, known as "Chemical Ali;" and former Vice President Taha Yassin Ramadan. Aziz denied personal involvement in any of the regime's crimes, saying, "I never killed anybody by any direct act." © 2004 CBS Interactive Inc. All Rights Reserved. This material may not be published, broadcast, rewritten, or redistributed. The Associated Press contributed to this report. TUNE IN: This week on "Face the Nation," Bob Schieffer talks to House Oversight Committee Chairman Elijah Cummings and Sen. Mike Lee. We'll also sit down with Robert Caro and a panel of authors. And we have more of Margaret Brennan's interview with Democratic presidential candidate Cory Booker.